You wake up. You look in the mirror. You recoil: What’s with those bags under your eyes? Was that there yesterday? You lean into the mirror a little closer. Yes, those are definitely bags. How should you get rid of bags under your eyes? Getting rid of bags under your eyes starts with uncovering the reason for why they’re there in the first place. Once you understand the cause of the bags or dark circles under your eyes, you’ll be able to find the most appropriate way to treat them. Here’s a step-by-step look at identifying the cause of bags under the eyes and then removing them. Having bags under your eyes makes you look older, tired, stressed or all three. However, that doesn’t mean that you are. One of the most common causes of having bags under your eyes is illness. Allergies, sinus infections and the common cold are all typical causes of having bags under your eyes. When you’re sick, fluids tend to build up in the region of your sinuses. This build-up can easily translate into fluids caught underneath your eyes. Because the skin around your eyes is quite thin, the fluid build-up is more noticeable underneath your eyes than it is in other places on your face. Another cause of fluid building up underneath the eyes is salty food. If you have a heavy meal the night before laden with sodium, it’s quite likely that you’ll have puffier-than-usual eyes the next morning. The reason is that fluid is retained by salts. When we eat something with a high salt concentration, we retain that fluid and we bloat. Once again, because the skin underneath our eyes is so thin, the excess fluid is especially noticeable in that part of our bodies. Besides illness, crying and salty foods, did you know that the position in which you sleep at night can also lead to having bags under your eyes the next morning? Sometimes, sleeping on your side or your stomach will lead to fluids pooling underneath your eyes. This is all thanks to the universal law of gravity and water naturally running to the lowest possible point. Sometimes, just adding a second pillow beneath your head or training yourself to sleep on your back may solve the problem of bags under your eyes. Heavy alcohol consumption, smoking, sleeping in eye makeup and the inevitable process of aging are other causes of eye bags and dark circles. “Occam’s razor” is a principle in science that states that the simplest, most obvious solution to a problem is typically the correct one. 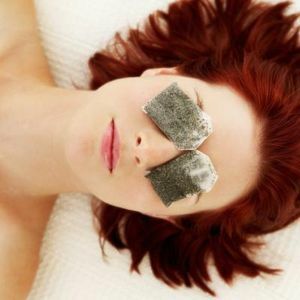 When looking for a way to treat the bags or dark circles underneath your eyes, look at the list of causes listed above and identify one or two that are most likely to apply to you. As mentioned above, seasonal allergies are one of the most common causes of having bags underneath your eyes. You can find over-the-counter allergy medication at discounted prices if you know where to look online. Zyrtec, cetirizine and chlorpheniramine can all be found for low prices at Amazon.com . If you’re looking for a long-term solution to your allergies that’s more natural and doesn’t rely upon medication, try out Carolee Bateson-Koch’s book Allergies: Disease in Disguise, in which the author discusses how to overcome allergies by relying upon proper diet and improving digestion. A netti pot, if used properly, is another safe, natural method for reducing the amount of fluid trapped within the sinus cavities from allergies or sinus infections. Is there a place for eye cream when it comes to treating under-eye circles and bags? The answer is that there is, but there are many other free options you can try first before resorting to expensive creams. As mentioned above, alcohol, sleeping in eye makeup, smoking and even sleep position can all contribute to puffy eyes. Therefore, before purchasing eye cream, use Occam’s razor and try eliminating these other bad habits in your life first. As for eye cream, you should know that these are more effective when used to treat dark circles than when used to treat bags. Bags are typically caused by fluid build-up, whereas dark circles tend to result from problems with the tiny blood vessels beneath the eyes. The best eye creams are the ones with caffeine in them, such as the paraben-free Caffeine Eye Cream. Made with coffee extract, the caffeine in this eye cream constricts the underlying blood vessels that cause the skin to look dark or blue. Once you’ve identified and treated the cause of the bags underneath your eyes, you can begin to enjoy a more beautiful face free from puffiness and dark circles. Always remember the Occam’s razor principle and start your quest for beautiful eyes by starting with the most obvious solutions to your problem. Not only are the most obvious answers usually the right ones, they’ll also save you money in the long run.